Grease a baking sheet and line with baking paper. Evenly mix the flour and cornflour and set aside. Cream the butter and sugar until light and pale. Add the rose water and lime zest and mix. Slowly add the flour mixture until combined. Cover the dough with plastic and rest in the refrigerator for 15 minutes. Remove from the fridge and roll out to roughly 1.5cm thick and cut out desired shapes. Cover and place in the fridge to rest for a further 15 minutes. While the dough rests, preheat the oven to 180’c. Bake the shortbread for 10-15 minutes or until lightly golden. Remove from the oven and cool. To make the minted sugar, crush the mint and sugar in a pestle and mortar. 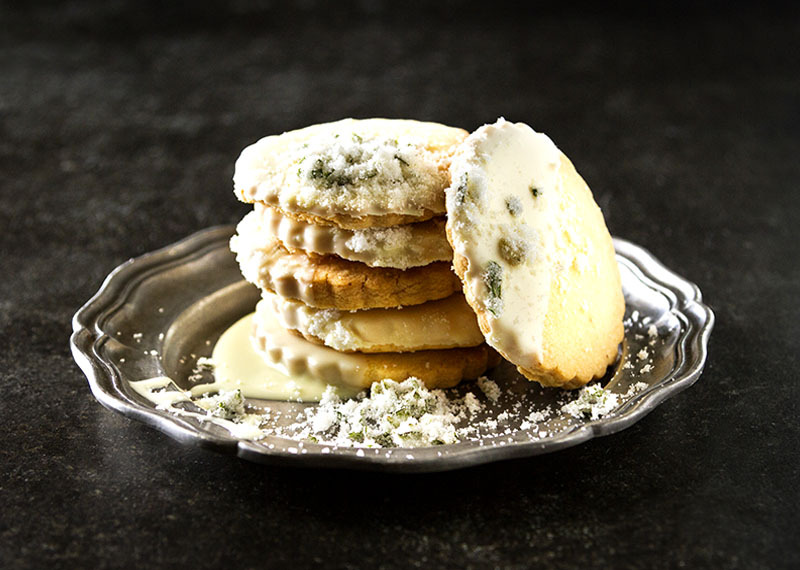 Drizzle the shortbread cookies with melted white chocolate and sprinkle with mint sugar and enjoy.